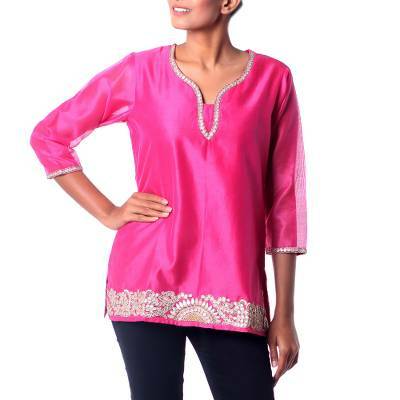 Elegant Bright Pink Tunic in a Cotton and Silk Blend, "Jaipuri Masala"
This stunning hot pink tunic is the creation of Isha Jain in India. Crafted of a cotton/silk blend, the neckline and hem of the tunic feature gold and silver gota embroidery, an applique-like technique that originated in Rajasthan and is traditionally used on wedding and formal garments. Gold zari embroidery, sequins and sparkling faux stones add extra glamour. 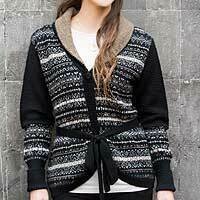 The semi-sheer tunic features three-quarter length sleeves and a cotton-lined bodice.